Mike Piazza: "Hey, Eric. You ever feel like someone is watching you?" Eric Karros: "Hold on, sweetheart. ... What's that, Mike?" MP: "I said, Do you ever feel like someone is watching you?" MP: "It's weird, ya know. Like, I'm pouring this bowl of fake cereal and I feel like someone is judging me, saying I should be eating Wheaties or something." EK: "I know what you mean. It's like someone is looking at me, telling me how I should do this, how I should do that." MP: "It's crazy. It's like someone is saying, 'Hey, Mike, shave that stupid mustache and trim those tacky sideburns.'" EK: "I can't get over this feeling that someone is managing my minutes. 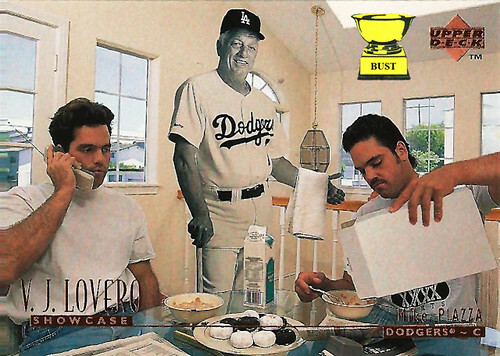 Like, 'Hey, Karros, you moron, hang up that 12-pound phone. It costs $4.50 a minute.'" MP: "Yeah, 'manage.' That's the right word. I feel like someone, I don't know who, is managing my every move, even here at our perfectly arranged pseudo-breakfast table." EK: "I feel like someone is telling me to wipe my greasy hair with a towel. Weird." MP: "Weird for sure. ... Hey, wait a sec. Who ate all those donuts? They disappeared." EK: "I don't know, Mike. I don't know."